In a bowl mix the soy sauce, mirin, rice wine vinegar, brown sugar, garlic and grated ginger until sugar has dissolved. Add the chicken and marinate for 15mins or preferably overnight in the fridge. Remove the chicken from the marinade and place on pre-soaked wooden skewers (makes 8), retaining left over marinade. Fry the chicken on both sides with the sesame oil until sealed and place in the oven for 15 mins at 170°C. Meanwhile, in a large pan, put the sliced ginger with the rice and water. Bring the water to boil, reduce to a low heat, cover and simmer until the water is absorbed (10-12 minutes). Reduce left over marinade by half and keep on a low heat. When tender, remove the chicken from the oven and place back into the warm reduced marinade, ensuring that each chicken piece is coated thoroughly. 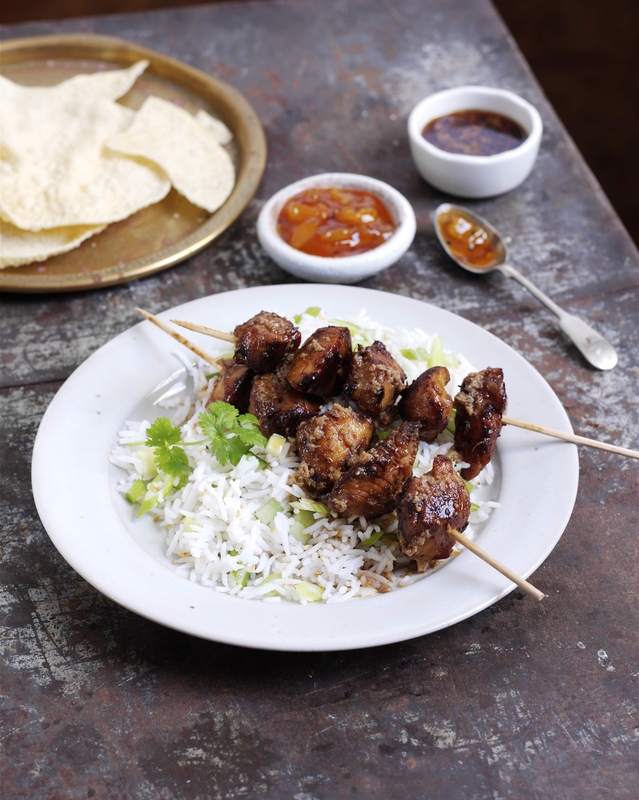 Gently stir the spring onion and cucumber through the cooked rice, and serve with 2 chicken skewers per person and sprinkle with sesame seeds to garnish.